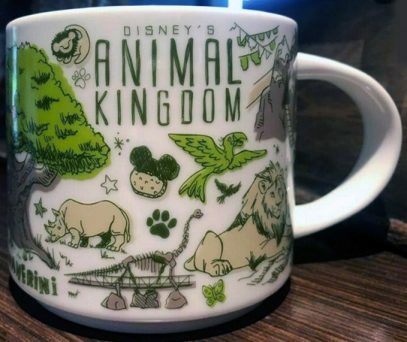 Starbucks Been There Disney – Animal Kingdom mug is returning back to its roots with the green palette used in its design. The Tree of Life is back and it takes a huge portion of the mug’s layout. There are many more small and large elements, which is very common to the new Been There series. We can see numerous animals covering all sides for the mug, namely lions (one of them being Simba cave drawing though), rhinoceros, elephant, birds and couple of dinosaurs. There are Expedition Everest and Fichwa Fellow Mickey (which means “hidden”) on the front of the mug. I paid some extra attention reviewing the phrases and words from the mug, trying to spot any mistake, which Been There Series is famous for, and I think I’ve found something. There is only one place where “Truly Alive with Adventure” slogan was used and it’s an ad from 1998, introducing the Animal Kingdom park. Was that done intentionally or not, the time will tell. Starbucks will definitely be looking at people’s reaction, and who knows, might as well update the design. What I also find strange, that they’ve placed the word “jambo” (hello) on the back of the mug and “kwaherini” (goodbye) closer to the beginning. People, I imagine, examine the mug keeping the handle in the right hand and rotating it counterclockwise. This way they will see “hello” after “goodbye”. This is a little bit odd, but on the other hand, I am probably being too picky. See the collage of all sides below, and as a reminder, you can still buy older versions of Animal Kingom mug from the YAH series online. Here are Animal Kingdom v1 and Animal Kingdom v2 mugs on Amazon.